Route: Through one of the most impressive of the Derbyshire Dales - one steep climb and some road walking, but mainly clear, easy footpaths. Part of the route is along a permissive path, which is closed on Wednesdays during the winter months. The route which we walked was actually a figure of eight. The first loop could be walked on its own, and there is also an alternative, shorter second loop which doesn't use the permissive path. English Nature information about Lathkill Dale. 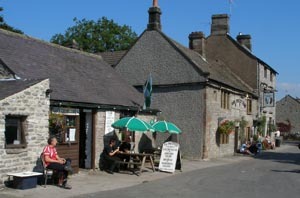 Refreshments: Cafe and pub in Monyash and very welcome refreshment at Lathkhil Hotel in Over Haddon. Time: We took 4 and half hours to complete this walk. Turn right out of the car park, and straight across at the cross roads. Where the road bends to the right (about 300 yards beyond the cross roads) continue ahead along the tarmac farm track. Almost immediately take the rough tracked on left (there is a public footpath sign). Shortly after passing through a gate, climb stone stile in wall on right (opposite a National Trust sign saying Ferndale). After crossing stile, head for stile and finger post in middle of wall on left of field. Cross this stile, following sign for Youlgreave. through first field stay close to wall on left. Go through wooden gate into next field. Before the end of this field cross stone stile on left, but continue to follow wall. When you come to a sign pointing left to Lathkill Dale, bear right on to farm track. Continue straight ahead at farm, following sign for Lathkill Dale and Youlgreave. Pass between pig sty on left, farm buildings on right and walk towards corrugated iron barn. Walk down the right hand side of barn to gap in wall and steps down. The path continues past limestone outcrops and then through wooden gate on to access land. Scramble down rocky outcrop and follow cliff face to left. 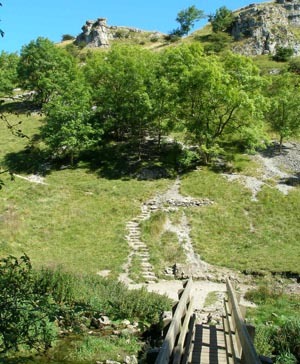 Follow steep path down heading for wooden stile, but don't cross the stile, instead take the path on the left. 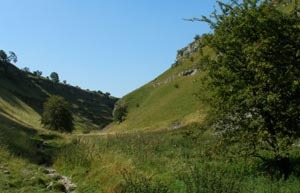 Continue walking through the wooded valley of Cales Dale until it meets Lathkill Dale. Cross the wooden bridge and decide if you want to continue with the second loop of the walk, or walk back to Monyash. Continuing the walk climb the steps and bear left. the path then zig zags steeply up the valley side with steps in places. At the top of the climb go through kissing gate on right. The path appeared to fork - we took the left hand route, heading for a gap in the opposite wall. Pass through the gap (which looks as though it was once a stone stile) and continue ahead. Cross a wooden stile, then almost straight away, a stone stile. Walk through field (used as campsite when we were there) and then through paddock. Continue through the farm yard to join farm road. Turn right on to single track road. There is another opportunity to take a shorter route after walking along the road for about 350 yards. You could take the footpath on the right, to join the route at the end of the concessionary path. We continued walking along the road for nearly 1.5 miles. About half way along this stretch a wider road joins from the left. When you reach Over Haddon turn right on to Main Street. 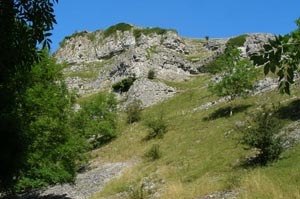 At next junction, the route to Lathkill Dale follows Dale Road down the hill on right. (Instead of continuing with the walk, we continued to far end of village for refreshment at the Lathkil Hotel). At the bottom of Dale Road take track on right opposite Lathkill Lodge. Go through wooden gate. 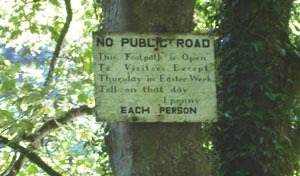 The path through this wooded section of the dale is not a public right of way. For about 1.25 miles you walk close to the stream, between the steep, wooded sides of the dale. There are caves and the remains of buildings left by mining activity. Pass through a wooden gate into an open area. After about 30 yards go through another wooden gate. If you have taken the second shortcut mentioned earlier, you will join the valley path here. The dale continues to be wooded on the left of the stream, but there are dramatic cliffs towering above the path. It's about two thirds of a mile from the last gate, back to the footbridge, with just one stile to climb. When you return to the footbridge, continue walking up the valley floor. The path continues for about a mile and a quarter, passing remains of quarry working at foot of Ricklow Dale, before levelling out and meeting road near public toilets and disabled parking space. Turn left along road and look for footpath marker on right. The path was quite overgrown with nettles, but became more clear after crossing stone stile to right of a metal gate. The path continues with field boundaries on left, until it meets a road. Turn left, then almost immediately, left again. The car park is just over 200 yards on the right ( a little further to the cafe or pub). Feedback forum - leave a comment this walk (please mention the walk in the topic line).